(1919-2000) George Morrison was born in Chippewa City MN, near Grand Marais on the North Shore of Lake Superior. From 1938 to 1943 Morrison attended the Minneapolis School of Art (now Minneapolis College of Art and Design). In 1943 he was awarded an Van Derlip Traveling Scholarship that enabled him to travel to New York City where he studied at the Art Students League in New York City. In 1948 he had his first solo exhibit at the Grand Central Moderns Gallery, New York City. In 1952 he was awarded a Fulbright Scholarship to travel and study art in Europe. He studied at Ecole des Beaux-Arts, Paris, and at Unverisy of Aix-Marseilles, Aix-en-Provence, France. In 1963 Morrison was appointed Assistant Professor of Art, Rhode Island School of Design. In 1970 he returned to Minnesota as visiting professor of Studio Arts and American Indian Studies, University of Minnesota. In 1973 was appointed the Professor of Studio Arts, University of Minnesota. In 1974 the Walker Art Center presented George Morrison: Drawings, an exhibit of line drawings curated by Philip Larson. In 1990 the Minnesota Museum of American Art and the Tweed Museum of Art presented a retrospective exhibit Standing in the Northern Lights. 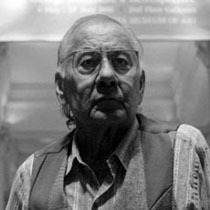 In 1997 he was honored in a ceremony at the White House when his work was a part of the exhibit Twentieth Century American Sculpture at The White House: Honoring Native America. In 1999 was honored as inaugural Master Artist in the Eiteljorg Museum of American Indians and Western Art, Indianapolis. In 1983 Morrison moved permanently to his studio / home which he called Red Rock at Grand Portage, until his passing in 2000.